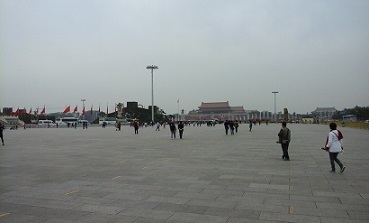 Tiananmen Square in Beijing is the largest square in the world: 440,000 square metres. On the square is also the Mausoleum of Mao Zedong. In the background of the photo is the gate to the Forbidden City. 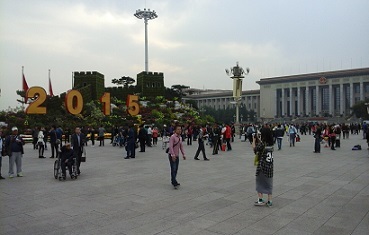 Along the west side of the Square is the Great Hall of the People. Along the other side is the National Museum of Chinese History. It is easy to reach Tiananmen Square. The square is downtown Beijing with a metro station. The wellknown Wangfujing shopping street is close by at walking distance. 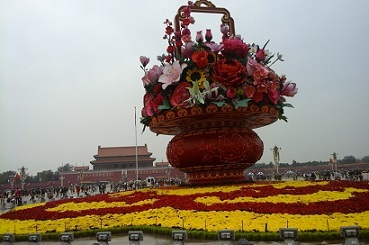 The first October in China is National Day. The week October 1–7 is called ‘Golden Week’. Allmost everybody has holiday. If you are in China during the Golden Week, don’t forget to book your flights or train tickets in time. In summer, the temperature in Beijing is hot (35 degrees celcius). Many Chinese women don’t want to burn their skin and have a parasol or hat to protect themselves against the sunshine. In winter the temperature can drop till -10 degrees celcius.